Successfully Added Mini Projector with Wifi + Wireless Remote to your Shopping Cart. As requested, presenting the magnificent Mini LED projector with WiFi capability that houses an internal lithium rechargeable battery for maximum portability. This LED projector runs on the Linux OS and provides users with direct internet access, be it for presentations or entertainment, this Mini LED WiFi projector is what you have been looking for. Designed with a sublime user Interface to provide users with joy and comfort in its use along with a mini wireless keyboard, so that you can sit back on your sofa and enjoy watching your favorite videos or going online to sites such as Flickr, YouTube on a massive projected 70 inch screen. The entertainment value that you will receive from this WiFi LED projector is next to none! This Mini LED projector that can fit so comfortably in your laptop bag can be connected to your LCD TV by using the included 3-in-1 RCA cable. In order to cover all bases, a USB port and SD card slot is available onboard the LED projector, allowing you to be able to instantly connect a USB key or insert an SD card and start watching all your favorite downloaded movies! 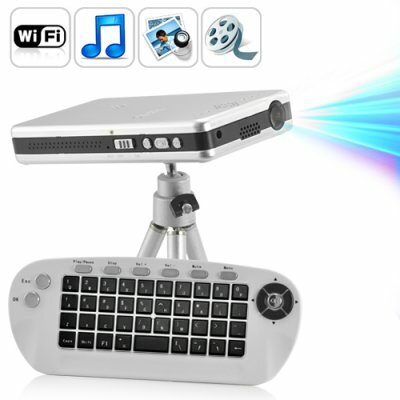 To further enhance the user experience, a mini wireless keyboard is included with this mini LED projector. The wireless keyboard provided with this projector helps in providing versatility while operating the user friendly internal menu system. This innovative and amazing min LED projector with WiFi is the ideal presentation and entertainment LED projector, it simply caters to your business needs as well as entertainment needs. Click "Add to Cart" Now and we'll express ship you a sample, and within a few days you could be the proud owner of your very own Mini LED WiFi projector with a mini wireless keyboard. Within the Network setup interface, there seem to be options for Wired (Ethernet) connectivity and GPRS/WCDMA along with TD-SCDMA that were not mentioned above, do these options work? This LED projector only connects to the internet via WiFi, the Wired (Ethernet) connectivity and GPRS/WCDMA along with TD-SCDMA are not activated on this LED mini projector model. This mini projector seems to get quite hot, is this normal? LED projectors generate more heat than standard Bulb projector, this is normal, its is always recommended to run LED projectors in cool environments.